New Frontier Group (NFG), a global leader in digital transformation, has partnered with Mambu, the leading SaaS banking engine, to extend its digital banking offering. The cloud-based model leverages NFG’s market leading opti-channel digital banking solution, powered by Mambu’s SaaS banking engine, to create a fully online and automated digital banking offering which allows institutions to rapidly go to market and deliver business value. “Customer expectations have changed and institutions need to be flexible enough to respond quickly in an evolving market. Our partnership with Mambu is a natural fit that creates an integrated solution where the approach to agility, integration, modularity is aligned. It is a partnership that can change the landscape by giving institutions a simple, single solution. 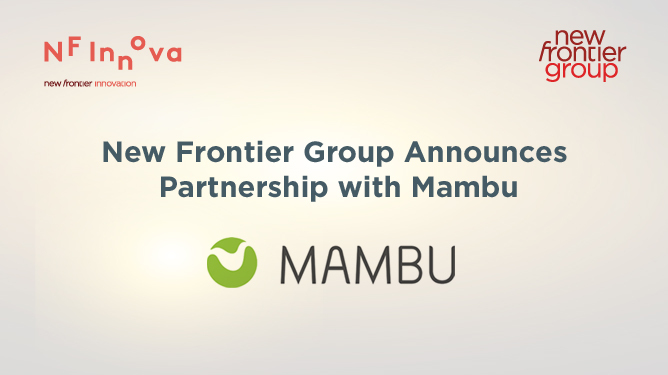 Together NFG and Mambu deliver a digital banking solution, which is quick to implement and easy to manage aimed at financial institutions supporting state of the art business models.” said Gregor Bierent, Managing Director, New Frontier Group. New Frontier Group (NFG) is the leader for Digital Transformation in Central and Eastern Europe and operates worldwide with direct subsidiaries in more than 20 countries. NFG’s dedicated company NF Innova provides a unique digital banking solution “iBanking” to visionary financial institutions by delivering a rich and seamless customer journey on any digital channel. NFG’s iBanking enables end-to-end automation of customer facing processes and improves customer engagement thru integrated Personal Finance Management, customer segmentation, smart bots and a complementary marketplace for financial and non-financial product offerings. For more information, visit New Frontier Group on: www.newfrontier.eu and find out more about our dedicated digital banking offering on www.nfinnova.com or connect us on LinkedIn, Twitter, YouTube and Facebook. lending portfolio. Launched in 2011, the technology powers over 6000 loan and deposit products which serve over 4 million end customers. With more than 250 live operations in over 46 countries, ranging from fintechs to traditional banks, Mambu is helping financial institutions evolve and thrive in the digital age. For more information, please visit our website, read our blog spot Hive, or connect with us on Twitter, LinkedIn, YouTube and Facebook.